The risk of pregnancy is a contributing factor in increasing mother maternal mortality (MMR). 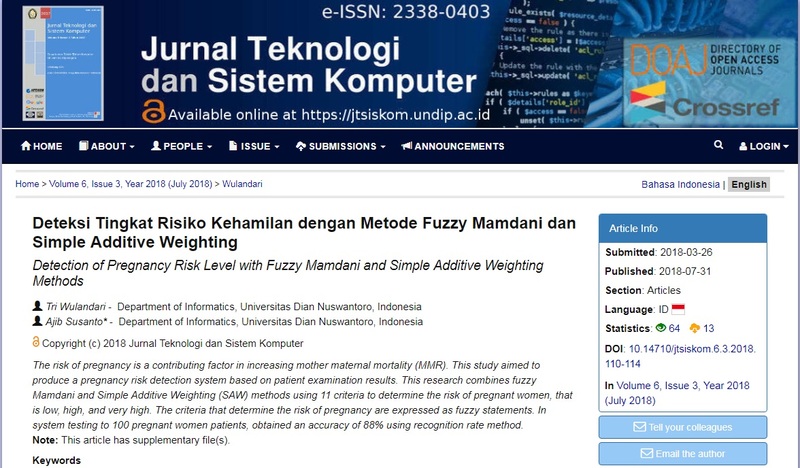 This study aimed to produce a pregnancy risk detection system based on patient examination results. 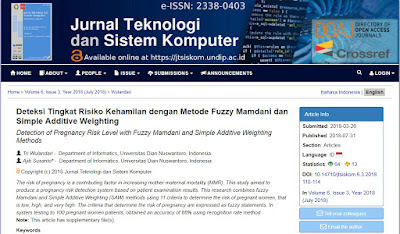 This research combines fuzzy Mamdani and Simple Additive Weighting (SAW) methods using 11 criteria to determine the risk of pregnant women, that is low, high, and very high. The criteria that determine the risk of pregnancy are expressed as fuzzy statements. In system testing to 100 pregnant women patients, obtained an accuracy of 88% using recognition rate method. Formulir pendaftaran email, mohon mengisi formulir secara lengkap, email harus valid. 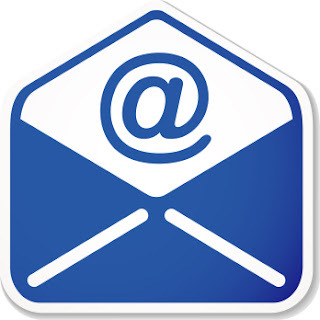 Silahkan meng-upload hasil dokumentasi dengan membuat satu folder sendiri lengkap nim dan nama di DRIVE untuk memudahkan pemantauan perkembangan dokumentasi yang telah dibuat. Batas akhir tugas untuk pertemuan 1-7 sebelum ujian tengah semester, untuk dokumentasi komplet 1-14 saat presentasi tugas akhir.